In Japan, Pepsi-Cola often teams with the Japanese company Be@rbrick and give away cell-phone straps of bears modeled after famous characters with purchases of their “Pepsi-NEX Zero Cola”. In the past they have offered Be@rbrick bears modeled after Paramount movie characters, and Star Wars characters. Be@rbrick has also offered in Japan figures modeled after the rock band KISS and MOS Burger staff. (MOS Burger is a Japanese fast-food chain). Well, Pepsi Japan has currently teamed up with Be@rbrick again. 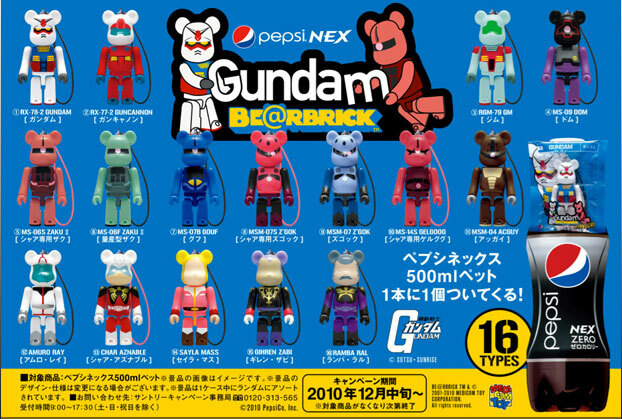 For a limited time, they are giving away cell-phone straps of Be@rbrick bears in the image of Gundam with purchases of Pepsi NEX Zero Cola. 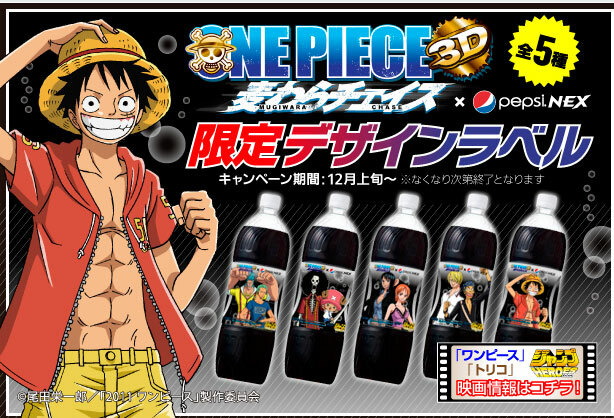 Another limited time only campaign that Pepsi Japan is currently offering is specially designed bottles of Pepsi NEX Cola with the “One Piece” manga characters on the label. This is to help promote the new One Piece 3-D animated movie titled 「麦わらチェイス」 (“Sugiwara Chase”). There are five different labels available. (There was a “One Piece” campaign in Japan about thirteen months ago for the previous “One Piece” movie titled “Strong World”). Is Gundam popular in your country? How about “One Piece“? Does Pepsi sell “NEX Zero” cola where you live? Do you like it?